Garden centers are terrific places to find those interesting and creative holiday gifts. One of my favorite gifts is a basket filled with organic products like gardening books, orange oil, garlic pepper tea, greensand, kelp, and compost tea. A basket of garden tools is also a good idea. Items can include gloves, interesting trowels (my favorite is called the garden scoop), folding hand saws (very useful for any gardener), hand pruners (best for those that use a scissor action, trombone sprayer (many gardeners haven’t even seen these) and interesting plant labels so you can remember the names of the plants you bought. Another good basket would be full of pet products – Muenster dog and cat food, the Missing Link, herbal shampoo, flea and tick products (the safe gentle natural one of course), flea combs, brushes and collars. 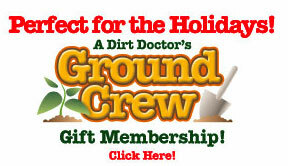 One of the best holiday gifts for your gardening friends might be a subscription to the Dirt Doctor Ground Crew that includes the monthly newsletter the DIRT, discounts on organic products, videos and seminars.